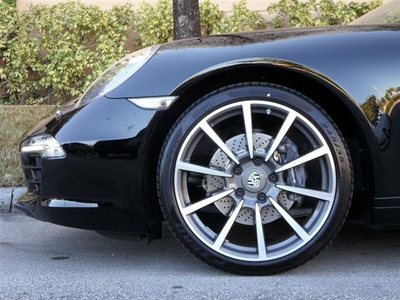 I have for auction a BRAND NEW Take-off set of OEM, Factory, Geninue Original Equipment Newly Introduced 20" 2012 Porsche 911-991 Rad Cerrera Classic II wheel set. The auction is for BRAND NEW 20" Wheel set and matching Porsche OEM, Factory Equipment Center Caps. Tires and TPMS are not included in this listing. 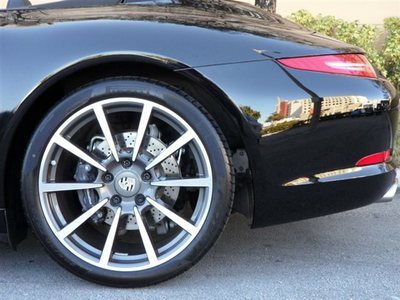 The wheels was a takeoff from 2012 Porsche 911-991 Carrera S with 8 miles. The wheels are BRAND NEW. There is no structural damage such as bends, cracks, curb rust or scratches. The wheels are straight, round and Brand New. My contact at the Porsche Dealership informed me after experimentation at the shop, they discover that this Porsche OEM 20" Rad Carrera Classis II wheel will fit both the Wide Body and the Narrow Body 911- 991, 997 and the 996 models.Plesee Note: For this wheel to fit a Wide Body 911, 997 and 996, you will need a 23mm spcacer only for the Rear wheels. The Front with the 51mm offset is fine. No spacers need for the Front. Again, this set will fit the Narrow body models which will require a 5mm spacer for the Rear wheel as well.. These wheels will fit Porsche, 911/991, 911/997 and the 911/996 WIDE and NARROW BODY. This wheels will fit WIDE and NARROW BODY 991, 997, 996, , from 1999 to 2012. It will fit the Turbo, C4S, Targa, C4, C2, Club Coupe,Carrera S, Cabriolet S, and Carrera C2. To fit the 911-997 and 996 Wide Body Model: The Porsche recommended tire size is 245/30/20 for the Front and 325/25/20 for the Rear for Wide Body Model with 23mm spacer for the Rear. The wheel has an offset of 51. To fit the 911-997 and 996 Narrow Body Model: The Porsche recommended tire size is 245/30/20 for the Front and 295 or 305/25/20 for the Narrow Body Models with 5mm spacer requires for the Rear. THIS WHEEL SET WILL FIT BOTH THE WIDE AND NAAROW BODY 911-991,997 and 996. THE AUCTION IS FOR WHEELS ONLY. PLEASE NOTE: eBAY COMPATABILITY CHART IS NOT CONSISTENT IN ANSWERING FITNESS QUESTION. PLEASE ASK ME DIRECT OR CONTACT THE DEALER IN YOUR AREA. PLEASE NOTE CAREFULLY: The Porsche Dealership tells me this wheels and Tires will fit a 911/997-996 WIDE and NARROW BODY as well as other Porsche Models. THIS IS A BRAND NEW SET. The Porsche dealership retails the wheel set alone for $8815.95 plus tax. The Matching Center Cap is set at a retail price of $320 for the set (4) plus tax. Please buy this set and save $$$$$$$ big. I will refund and pay the full cost to ship it back if the wheels are not in the condition and quality as I have describe. Please note that the wheel will be ship in each individual box to safeguard against damage.